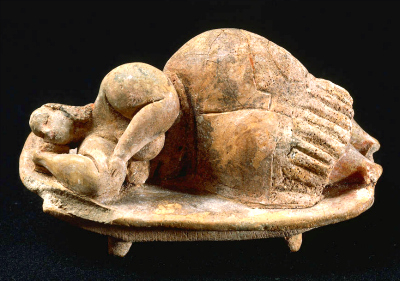 Experts know little about the 5,000-year-old 'Sleeping Lady,' discovered in a Neolithic burial ground in Malta. When construction workers accidentally uncovered a Neolithic burial ground in Malta in 1902, they stumbled upon quite a site. Dating from around 4000 to 2500 B.C., the Ħal Saflieni Hypogeum is a labyrinthine underground complex, decorated with red ocher spiral and honeycomb wall paintings and cut with bays, windows, carved roof supports and other architectural features mimicking those of contemporaneous above-ground temples. Inside, archaeologists discovered many artifacts and human bones, some amid ocher deposits, as if to represent blood. Unesco, which in 1980 added the Hypogeum to its World Heritage list, calls it "one of the best preserved and most extensive environments that have survived from the Neolithic." All these decades later, experts still do not know much about the people who built the Hypogeum, where they came from, or why they died out around 2500 B.C. Suddenly, the population simply disappeared, though no signs of war, invasion or natural disaster have ever been found. They had no written language, leaving only conjecture about them and their culture. In one way, though, there's no mystery about one of the objects found in the Hypogeum among the pottery, carved animals, amulets, beads and clay figurines. The "Sleeping Lady," as she is known, is a remarkable treasure—if one whose true nature and full significance may never be determined. Her most probable date of origin is c. 3000 B.C., but that's not sure, either. 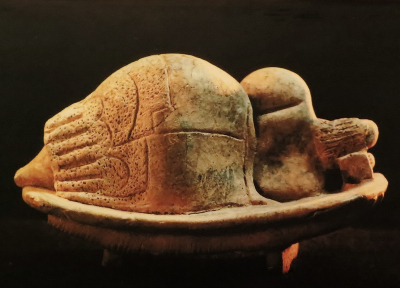 "Sleeping Lady" now resides in the National Museum of Archaeology in nearby Valletta, in a dark gallery, all her own, that is meant to simulate her former surroundings. She's small—about the size of a man's fist. Like other terra-cotta statues excavated at Malta's prehistoric sites, she is corpulent, with bulging upper arms, wide hips and ballooning thighs that overwhelm her small head. Unlike the others, she is nearly complete and wonderfully detailed considering that whoever made her had only primitive tools of bone, stone and, possibly, wood with which to work. "Sleeping Lady" strikes a completely lifelike pose. She lies on her right side, with her head tilted slightly upward and resting on a hard pillow that is held in place by her right hand, her right arm positioned naturalistically. Her left hand, with tiny fingers, finds a comfortable spot on her right elbow. She is naked to the waist, revealing ample breasts. She wears a skirt covering her knees that is decorated near the bottom with fine pleats and dots that some believe resemble embroidery. Both the front and back of her skirt are marked down the center, as if joined by a seam, and the skirt seems to have a waistband. Her feet, unfortunately, are missing—but they would have overhung her bed, or couch, just a little. The bed itself sags slightly under her weight. And if visitors could turn it over—a picture on the wall nearby shows this—they would see a neat, slatted framework and glimpse a straw mat covering it. Her hairdo is downright strange: Her scalp has been shaved bald from her crown down the back of her head to about ear level. Thereafter, her hair drops to her shoulders in what look like tight finger-curls, in contrast with the short bobs of other female statues of the period. In a few places—the crook of her neck, the seam down her rump—there are tinges of ocher, so she may have been decorated with color at one time. But was she herself decoration? Or did she serve a purpose? That we do not know. "Sleeping Lady" has so far proved to be unique, but she comes from a culture that produced other so-called fat ladies (lacking heads and sometimes flat-chested, some may in fact be fat men or perhaps asexual), many also dressed in pleated skirts. These have been interpreted by some scholars as goddesses—mother goddesses, earth mothers, fertility goddesses—whose obesity signifies the abundance of the land in which they were a totem. Other experts venture further into speculation, suggesting that the "Sleeping Lady" may demonstrate the rite of incubation—a spiritual practice common in many ancient cultures in which one sleeps in a crypt or sacred area in hopes of receiving, through dreams, the seed or spirit of an ancestor or knowledge or healing inspired by the gods. In another very logical interpretation, "Sleeping Lady" may simply be an illustration of death, or death as eternal sleep. Perhaps she is also an allusion to belief in an afterlife, which scholars say was prevalent in Malta when the Hypogeum complex was erected. Certainly, though her mouth has eroded, she looks relaxed, even content. And well she should. The enigmatic "Sleeping Lady" has become a powerful symbol of a lost civilization.